REMINDER: We are having our Registration Night at 7:30pm on Wednesday 3rd October 2018 at West Park Rugby Club, The Sycamores, Bramhope, LS16 9JR. The new season’s programme is attached below. Jerry Lee will be using Peter Gathercole’s Fly Tying Bible as the reference and each fly in the programme is referenced in this book. Jerry proposes to discuss and show variants upon each pattern. There is space in the programme for 6 guest speaker nights which usually include a buffet and raffle during the break. We also hold buddy nights to deal with individual requests for help with your tying. We are uncertain how many complete beginners we might have joining us so it is proposed that we plan and deliver a beginners programme as necessary. Our first Guest Speaker is the top notch angler and author Jeremy Lucas who will be well known to many of you. 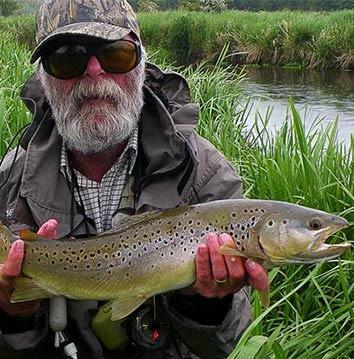 Jeremy has represented England in international competitions in all disciplines of fly fishing and written a number of excellent books. He will be joining us on Wednesday 10th October. The programme will include all the bronze and silver level flies for the national FDG accreditation awards and will be led by Jerry Lee and Melvyn Wood. There are 3 buddy style nights built in for those wishing to follow either the FDG bronze or silver award syllabi. We are going to have 3 classes of fly tying competitions – the Apprentice Cup for “Novice”, a new trophy for “Improvers“ and the Herbert Harris Cup for the “Advanced” tiers group. The trio of Flies for these awards will be selected from the Bronze, Silver and Gold patterns and need to be handed in by the end Feb 2019. Generally, anybody can enter any class providing they have not previously won it. This entry was posted in Events, Fly Tying, News, Programme and tagged demonstration, fly tying, Jerry Lee, programme on 3rd October 2018 by Chris Carter. Guest Night with Matt Eastham giving a talk on successful North Country patterns. This entry was posted in and tagged demonstration, fly tying, Matt Eastham, programme on 11th January 2017 by Chris Carter. Registration night for new members. Jerry Lee and Melvyn Wood will be doing a tying demonstration. This entry was posted in and tagged demonstration, fly tying, Jerry Lee, Melvyn Wood, programme, tying night on 5th October 2016 by Chris Carter.